Hello everyone, another requested post from me today so I hope my regular reader don’t mind. This post is my first on my teacher training journey and as I began thinking about it roughly around this time last year, I thought it would be beneficial to write up a post now for those of you about to begin your final year at University. This is going to be very text heavy and I will be going into as much detail as I can, so I recommend you get yourself a cuppa before you begin. Before I start talking about the route I have picked and why, I want to talk about WHY you may want to go into teacher training. I have just completed my second week of training and I can honestly say I have never been so exhausted in my life! The journey to becoming a teacher is very tiring and I think its important to know that to go into teaching, you are not doing it for the money, or for the security of the job. You are doing it because you love children, because you enjoy learning as-well as teaching and because you yourself want to play a part in shaping the next generation’s future. These things are crucial and if at this point you are unsure about either of these things, then it is worth rethinking your decision. A teacher’s day is not 8am-4pm, although of course it varies but I have already, in my first week of training, been in my school at 7:45am and come home at 6:30pm. As a teacher you spend a LOT of your time working and that is a reality which is vital to keep in mind. In many ways it is much more than a 9-5 job, and I think its valuable knowledge to go into the process with this in mind. You really have to want to teach for the sake of teaching, intrinsic motivation is key! Moving on to the routes into teaching, there are a few and it is worth having a look on the UCAS teaching website as there’s a lot of information on there, with videos too explaining the key points of each route. If you haven’t got a degree yet and definitely know you want to go into teaching, you can do a 4 year degree, which will be entirely focused on education and should provide you with a PGCE qualification too. You do not need a PGCE to teach in the UK, however this qualification means you are qualified to teach worldwide. It was vital for me to pick a route which allowed me to work towards this qualification as I plan to move abroad in the future and experience life outside of the U.K. You do need to get Qualified Teaching Status to work as a teacher in the U.K and this is available to complete through almost every university, as well as many collages. There are also some schools which offer teacher training with PGCE, but you will not have to go to University yourself, it is all done through the school. A lot of people choose to do a degree in their area of interest and then go into teacher training, which is the path I personally took. Although I had a pretty good idea that I wanted to teacher in first year, I didn’t necessarily want to spend a whole 3 or 4 years studying to be a teacher and decided to do a degree in developmental and educational psychology instead. I LOVED the course, aside from the statistics element I really enjoyed what I was studying and that made a big difference to my university experience. The two main routes are University based ITET training and School-led ITET training, with the latter being government preferred. I don’t know much about the University route, however from what I have read and been told, this type of training is done in blocks. So you will spend a few weeks in University lectures , earning the theory of teaching in the traditional university way which we have all experienced. Then you will spend a few weeks in a school and so on. This route is great for people who prefer the university based style of learning. The School-led route AKA School direct is what I have chosen because it made the most sense for me personally. We spent 3-4 days within our school and the remaining 1-2 days in the training school. This means we are directly immersed in school life from day one and for more than half the week every single week of the course. So we not only get to build bonds with the children in our class, but we are constantly learning from the teacher we are shadowing and others across the school. It has only been two weeks, but I already feel like I've soaked up a fountain of knowledge! I really like having a few days with my class and then coming back with other trainees to discuss our week and encourage each other. It’s really beneficial to see so many people from different walks of life, on the exact same journey as i am and we are all a really supportive bunch. I already feel like I can turn to anyone in the room and ask for advice, so just having that support goes a long way! Within this programme there are two strands, salaried and non-salaried. Getting a place on a salaried programme is VERY difficult, you usually have to have three years of working within a school and their support to obtain this. I tried because I have been tutoring for over 3 years, however that wasn't enough. So it's worth bearing that in mind. 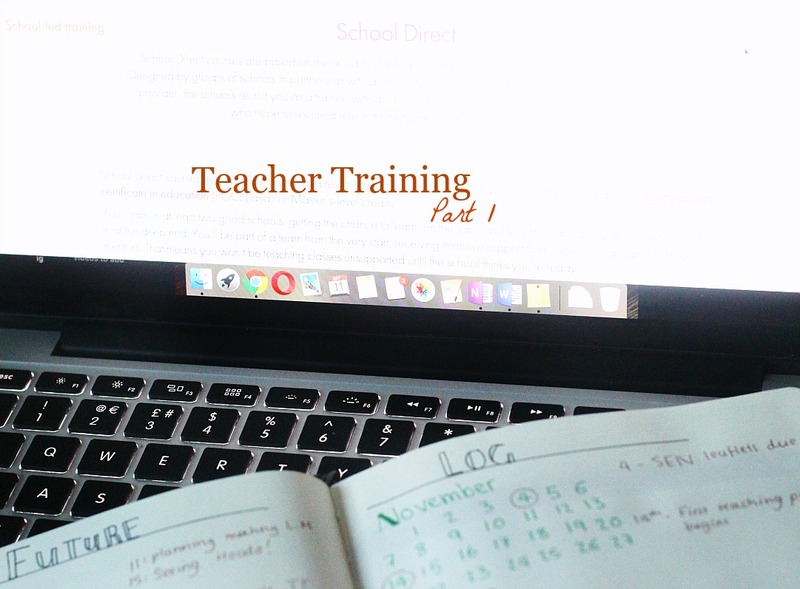 The third route which I briefly looked into before I began second year is Teach First, which is an intensive course over 6 weeks, where you're trained to be a teacher during the summer and you begin teaching in September. It is not the most accessible course, my nearest was in London and as I'm not willing to move out of my home yet, it would have been a very expensive decision to make. Anyways as I really don't know too much about it, I'd suggest you spend some time reading their website. This part is quite straightforwards, you have to apply through UCAS just as you did with University and they have a course searcher tool which is a life saver. You search your post code or what course you're wanting to apply for (school direct, university based etc.) and they provide you with a list of courses. When you click on the courses you can read more about the training provider and get an idea of what they offer, what they expect and what you can expect in terms of the interview too. Although they have their own section of the website here and again I'd highly recommend you having a little browse around on here because there's a lot of helpful info! You have about a month till you can apply for teacher training next year, UCAS application opens on the 18th of October so you have a good amount of time to think about which route is good for you. The first step for the application is the basic name, date of birth, education thus far etc. It can take a while to complete, but the good thing is you can save and return later - which is what I often did! Then you have the option to apply for three courses and they don't all have to be the same type. For example your first choice could be a school based one, second could be a university based one and third could be another school based. Places are allocated on a first come first serve basis, so it is important to get a little bit organised NOW and make your decisions before the start date (18/10/16), to avoid disappointment. You'll need to have two references before you can submit your application, I asked my manager to be one and my dissertation tutor and they both got back to me within a week so I didn't have to wait too long. However if I had to apply again, I'd ask my references a good fortnight BEFORE the application open date begins so in that first week I could submit everything and have that peace of mind. In order to train to be a teacher, you have to complete the professional skills test which consists of a maths and an english test. The first time you sit them is free but if you fail, you'll have to pay for the second round. These are not as hard as you may have heard - my biggest tip is to practice online as much as you can! The mock tests are available here which you can access once you've signed up on the gov website. The reason the practice tests are so important is that they really give you a feel for what the real thing will be like, the format of the test, the timings and the visual layout are really helpful to see. I sat my tests in January of this year and it was a relief to get them out of the way before my interview process began, so start looking at these as soon as possible. Yes, another one of those is required! This is the part I procrastinated the most, because I honestly didn't know how I'd articulate why exactly I wanted to go down this path and what I could offer to children's lives should I get past the application! However this section of UCAS really helped and I tried to keep it as straight to the point as I could. I did delete a lot of corny stuff, but it is important to keep at least one or two really honest and perhaps slightly cringy things in here, because it shows that you are passionate about wanting to teach. Reference to your previous experience working/volunteering in schools or working with children is a biggie that you have to include. Definitely get someone to read over it before you submit it as once you've submitted your application, you can't make any changes and it will be the only one used for all courses that you apply for. Once you've completed everything and your references have sent in their required pieces, you can proceed to pay. It costs £24 to apply for teacher training and this covers Apply 1 and Apply 2. Essentially the first time that you send off your applications, the course providers that you have chosen have 40 days to review your application and get back to you with an interview date. Once those 40 days are over you'll have a certain amount of time to decide which of your offers you want to accept - and you can only accept one! You'll get a welcome email from UCAS just before this, with an ID number that'll let you track your application and if you aren't successful, you wait for 'Apply 2' to open up. Then you have the option to apply for different programmes, but one at a time rather than picked 2 or 3. Personally I only applied for the School direct course as I knew it was the only one I wanted to do, however I applied for both salaried and non-salaried. Sadly as I've already mentioned I got rejected from the salaried 😪 but I was happy to receive an interview date for the non-salaried! I was going to cover the interview process in this post, but its already VERY long and lengthy. So in approximately a month I'll be writing that post up for you lovelies, meanwhile I hope this has been helpful. Please do leave me any questions you have below and if you have any specifically about the interview process also let me know so I can include them in that upcoming post! My hands are aching and its way past my bedtime now, so I'm off but I shall be back soon with a makeup related post this week for sure.